It’s late October and lucky for me I still have tomatoes on the vine in my garden. These late red beauties have perfect timing. 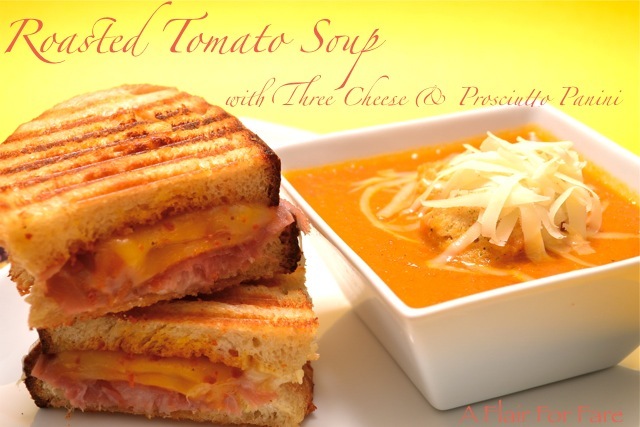 Cool autumn weather has arrived and I have a craving for spicy tomato soup and a thick gooey grilled cheese sandwich. This roasted tomato soup recipe from 12 tomatoes is super easy and has a delicious smokey flavor. Pair it up with my Three Cheese & Prosciutto Panini and you’ve got a dynamic duo. 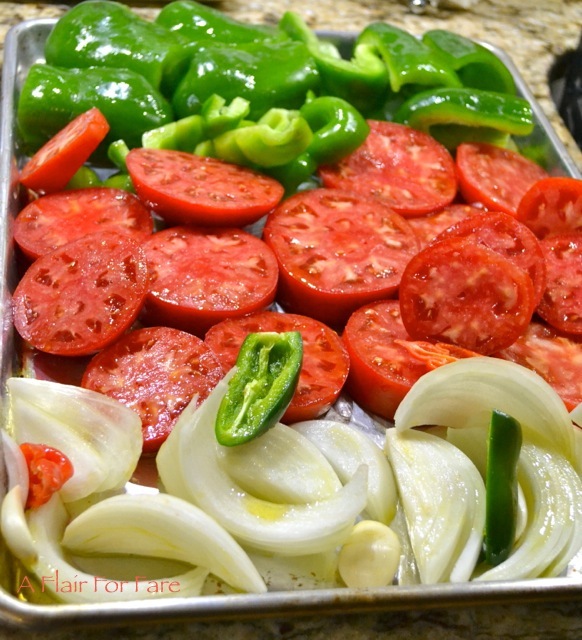 Spread vegetables on a large rimmed baking sheet. Drizzle with olive oil and toss to coat well. Roast until tender, 20-25 minutes. Put roasted vegetables into a Vitamix or blender with paprika, basil, salt, pepper, vegetable broth and cream. Blend to a smooth puree. Pour into soup pot and simmer over low heat 10 -15 minutes. Add additional seasonings as desired. Serve with freshly grated parmesan cheese and croutons. Makes 4 servings. Note: if you can’t find smoked paprika, you can use a chipotle or adobo sauce instead. Start with 1 teaspoon and add more according to your taste. Slice bread for sandwiches. Spread pesto on insides of both slices. Layer jack cheese, prosciutto, mozzarella and parmesan on one slice of bread. Top with 2nd slice. Butter top of bread and place butter side down on panini press. Butter top side of sandwich. Press lid tightly and grill until bread is toasted and cheese has melted. I will definitely be trying this one. Looks delicious.